Is your Sim tired of having to fetch their own beverages? Longing for decadent furniture? Then we’ve got some great news for you: The Sims™ 4 Vintage Glamour Stuff Pack* is out right now! If your Sim really enjoys the finer things in life, then this pack is going to be perfect for them. Let’s start with the new Butler NPC! 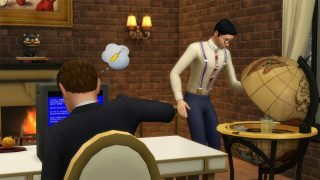 Your Sim will be able to hire a Butler to make their lives just that little bit easier and more comfortable. Fancy a drink? Butler. Ready for dinner? Butler! Cleaning? You guessed it, BUTLER! This helpful NPC is going to make your Sim’s life easier and give them more time to do the important things in life, like throwing lavish soirees and dressing excellently. Speaking of dressing excellently, there’s also the Vanity Table! Here your Sim can adjust their make up, without having to go in to Create a Sim. Kids can also use this item, though the results can be a lot messier! 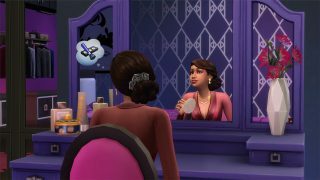 Of course, your Sim can also use it to perform most of the other mirror interactions too, with the added luxury of being able to sit down while they give themselves a pep talk. And if you’re going to have a Butler & look the part, then you should probably re-decorate too! 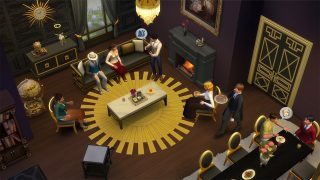 There’s plenty of great decorative and furnishing items in this pack to make your Sim’s home feel decadent and glamorous. Of course no opulent home would be complete without the 16th Century Monte Vista Globe Bar, making the perfect centerpiece in any Sims home. Enjoying Vintage Glamour Stuff? We’d love to see some screenshots of your Sims! Come talk to us on Twitter & Facebook using #TS4VintageGlamour.